In 2005, dead cat bounce was awarded the goethe-institute-prize and ZDF- theaterkanal-prize. by and with: chris kondek, christiane kühl, victor morales, alexander schröder, marc stephan, hannes strobl and simon versnel. tonight, we won´t be playing for your money ! tonight, we will play with your money ! 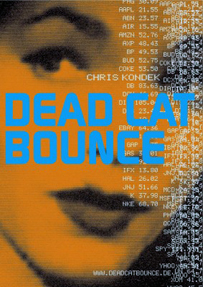 dead cat bounce is a stock market performance. it is a theatre piece about money, international cash flow, power, companies, speculation, greed and fear – and, at the same time, distinctively more than that: dead cat bounce is not only about the market, dead cat bounce is actually playing the market. in each performance we take the box office of that very night and invest it for 90 minutes via an e-brokerage account at the new york stock exchange. this is possible because european show time (8:30 pm–10 pm) parallels trading hours on wall street (2:30 pm–4 pm). our goal is to make, during the show, a profit one percent. If we do, we share the winnings with the audience (it is their money, after all). If we don´t, we act like anybody else and call it bad luck or fate and send everybody home hungry. dead cat bounce is a live performance that totally relies on and works with real time information. the same charts and graphs that professional traders are using surround us on stage. while mixing video, music, stories and internet surfaces, the rhythm of the show is given by the fluctuation of prices on the stock exchange that very evening. The performance of the stocks, the drama of the market defines the dramaturgy on stage.